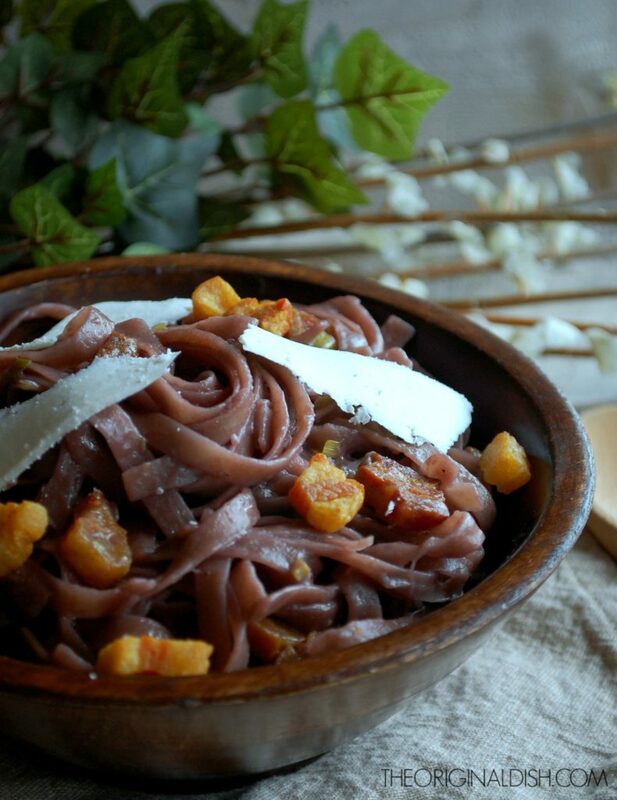 Pasta & wine…a match made in heaven. 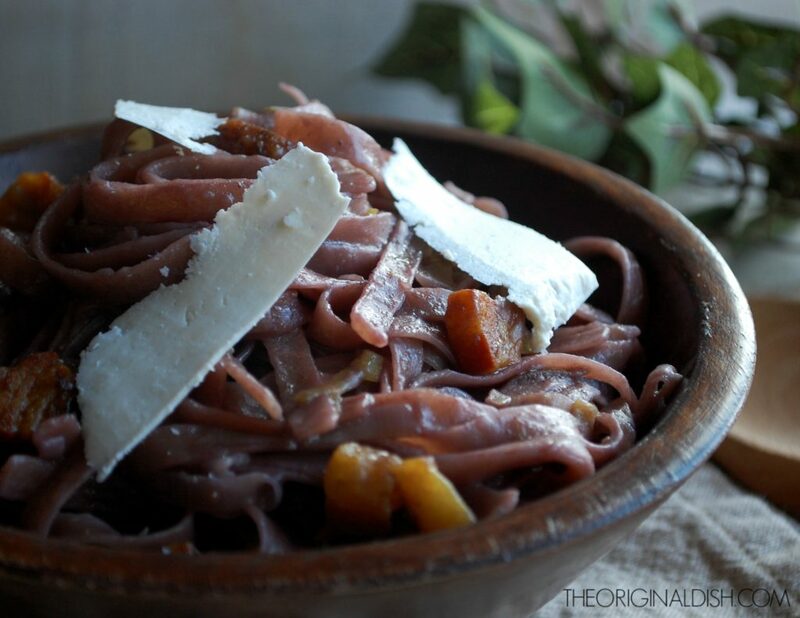 Instead of just adding wine to the sauce or having a glass alongside your pasta, why not cook the pasta directly in the wine?! This fettuccine gets a nice red wine bath as it cooks. And the result is unlike anything you’ve had before. For this dish, pick a wine that you enjoy drinking but isn’t overly expensive. You want a pleasing flavor without spending a lot because a good amount of the wine will get discarded at the end. I first combine the wine with water to cook the fettuccine. Once the liquid becomes all nice and starchy, I use some of it to create a sauce. It thickens and coats every strand of the al dente fettuccine. And my favorite part? 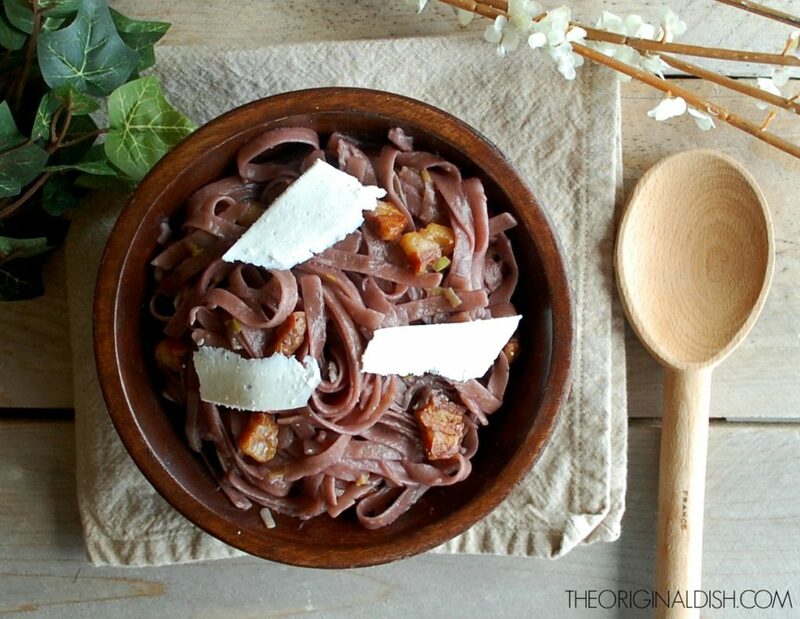 You can barely notice the color of the sauce because the fettuccine itself will turn a beautiful reddish-pink color that is a perfect touch for a date night (or when you just want to treat yourself). I leave the rest of the dish fairly simple. I usually don’t like when pasta is overwhelmed by a ton of other ingredients. The subtle flavor of wine should be the star, while a couple of other flavors play supporting roles. Crispy pancetta, for example, is a must! 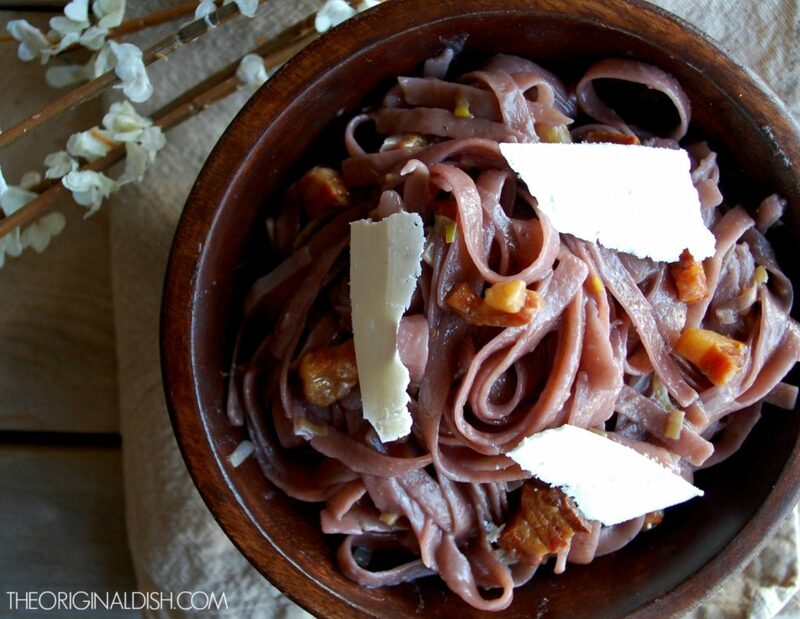 The little salty bites of cured pork add a wonderful meatiness to the fettuccine. After rendering the pancetta, I cook leeks in the leftover drippings. The leeks soften and caramelize just enough to create silky strands running throughout the dish. The final touch is a few thick shaves of ricotta salata right on top. The bright white contrasts the deep color of the fettuccine, and once you get over how pretty it is, it’s time to dig in. Enjoy! In a medium pot, bring the wine and water to a boil. Salt the liquid. Add the fettuccine and cook 2 minutes less than the box’s instructions. Meanwhile, in another medium pot, heat the olive oil over medium heat. When the oil is hot, add the pancetta and cook until crispy. Using a slotted spoon, remove the pancetta from the pan and reserve. Leave about 3 tablespoon of pancetta drippings in the pot. Add the leeks, season with salt and pepper, and cook until soft and slightly caramelized. When the pasta is nearly done cooking, remove 2 cups of pasta wine/water and add it to the leeks. Raise the heat to high. Drain the pasta and add it to the leek pot once the liquid begins to bubble. Toss the pasta for a minute or two until the sauce begins to thicken and coat the pasta. Add the reserved pancetta and Parmesan cheese. Toss well to combine. Season with salt and pepper to taste. Serve immediately. 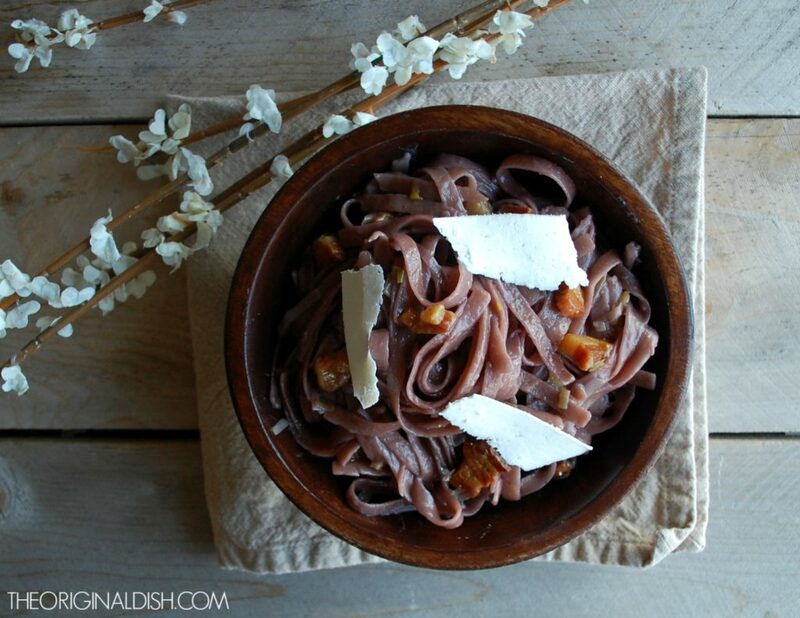 Serve the fettuccine in a large bowl with a few thick shaves of ricotta salata on top. I’ve gotta try this! 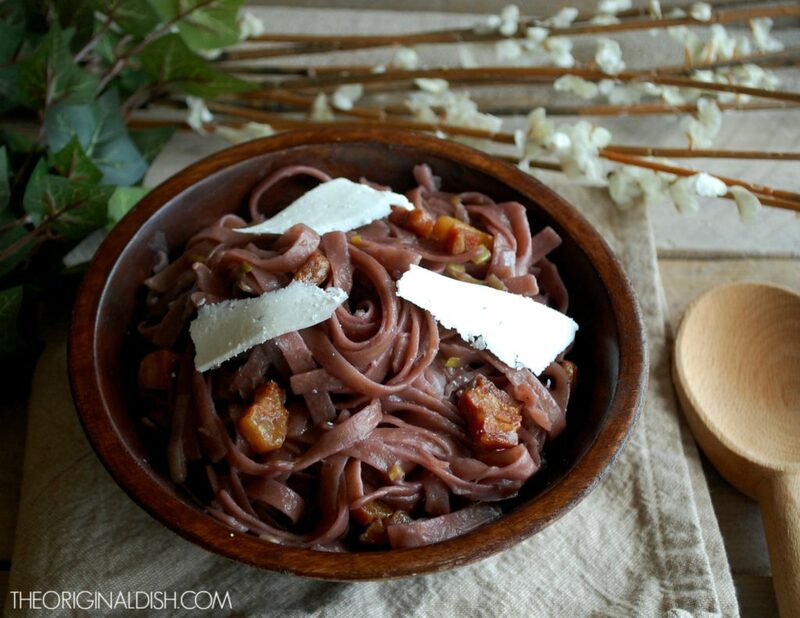 Super creative and I love the flavor combos – red wine, pancetta, leeks and parmesan…delicious!